Songs of Eretz Poetry Review is pleased to present “Emphysema” by Kristin LaFollette. Ms. LaFollette received her BA and MA in English and creative writing from Indiana University. She will begin the PhD in English program at Bowling Green State University this fall. Ms. LaFollette’s poems have been featured or are forthcoming in: FIVE2ONE Magazine, LEVELER Poetry Mag, Lost Coast Review, The Light Ekphrastic, The Main Street Rag, Poetry Pacific, and NEAT Mag, among others. She also has artwork featured in Harbinger Asylum and forthcoming from Plath Profiles: An Interdisciplinary Journal for Sylvia Plath Studies. She lives with her husband in northwestern Ohio. You can visit her at kristinlafollette.blogspot.com. Poet’s Notes: This poem combines several different points in time. I wrote this poem after visiting my great-grandfather and sorting through the myriad like-new antiques he had sitting in his attic. His house is like a time capsule; everything is exactly the same now as it was when the house was built--the shag carpeting, the 70s yellow and green accents, the old furniture. However, the poem really isn't about his house; it only was the spark that inspired the poem. The poem is about people and the way different generations are tied together by these possessions. When my husband and I were first married, we moved into a house that hadn't been updated since the 70s. 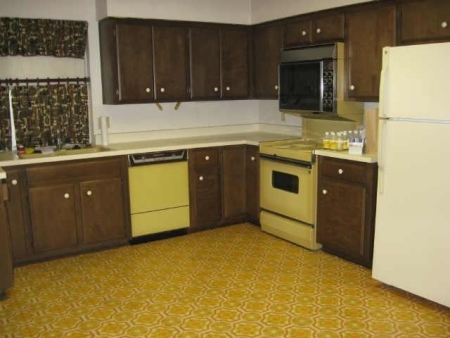 It still had a bright green counter top with matching tile, old light fixtures, and peeling wallpaper. It took a lot of work to get the place in better shape, but being in my great-grandfather's house that day just reminded me that these "old things" once held a piece of someone and were enjoyed by the families and people that lived before us. These things help people live on and let us remember the past and a time when things were simple and we didn't have technology holding us back from experiencing "real life." So this is a tribute to my grandparents and family members before me and the things left behind that help tie us all together as a collective humanity. Editor’s Note: The poet captures the feel of the 70s here (alas, I date myself) with a kind of gritty nostalgia that I find appealing.